Potter or Mason wasps (Eumeninae) nest in holes in the ground, in hollow stems, or construct nests from clay. Females lay an egg in each individual cell and provision the cells with partially paralysed caterpillars. The cell is then sealed. The masarine Pollen wasps provision their nests with pollen and nectar. Paper wasps (Vespinae) are social, constructing communal paper nests. Larvae are fed on chewed-up, soft-bodied insects such as caterpillars. Identification Atlas of the Vespidae (Hymenoptera, Aculeata) of the northeastern Nearctic region. Iconography of the Vespidae of the World. Wasp reporting tool for Cape Town invasive wasps. Log your sighting to streamline the booking process for a control team. Arévalo, E., Y. Zhu, J. M. Carpenter and J. E. Strassmann. 2004. The phylogeny of the social wasp subfamily Polistinae: evidence from microsatellite flanking sequences, mitochondrial COI sequence, and morphological characters. BioMed Central Evolutionary Biology 4: 8. Bequaert, J.C. 1918. A revision of the Vespidae of the Belgian Congo based on the collection of the American Museum Congo Expedition: with a list of Ethiopian diplopterous wasps. Bulletin of the AMNH 39: 1-384. Brothers, D. J. and J. M. Carpenter. 1993. Phylogeny of Aculeata: Chrysidoidea and Vespoidea (Hymenoptera). Journal of Hymenoptera Research 2: 227-304. Carpenter, J. M. 1982. The phylogenetic relationships and natural classiﬁcation of the Vespoidea (Hymenoptera). Systematic Entomology 7: 11–38. Carpenter, J. M. 1982. Vespoidea, Masaridae, Eumenidae, Vespidae. In Parker, S. (ed. ), Taxonomy and Classification of Living Organisms: 676-677. McGraw-Hill Co., New York. Carpenter, J.M. 1986. A synonymic generic checklist of the Eumeninae (Hymenoptera: Vespidae). Psyche 93: 61-90. Carpenter, J. M. 1987. On “The evolutionary genetics of social wasps” and the phylogeny of the Vespinae (Hymenoptera, Vespidae). Insectes Sociaux 34: 58-64. Carpenter, J. M. 1987. Phylogenetic relationships and classification of the Vespinae (Hymenoptera: Vespidae). Systematic Entomology 12: 413-431. Carpenter, J. M. 1988. The phylogenetic system of the Gayellini (Hymenoptera: Vespidae; Masarinae). Psyche 95: 211–241. Carpenter, J. M. 1993. Biogeographic patterns in the Vespidae (Hymenoptera): two views of Africa and South America. In P. Goldblatt (ed. ), Biological Relationships between Africa and South America: 139–155. New Haven, CT: Yale Univ. Press. Carpenter, J. M. 1996. Phylogeny and biogeography of Polistes. In Turillazzi, S. and M. J. West-Eberhard (eds. ), Natural History and Evolution of Paper-Wasps: 18-57. Oxford University Press, Oxford. Carpenter, J. M. 1996. Distributional checklist of the species of the genus Polistes (Hymenoptera: Vespidae; Polistinae, Polistini). American Museum Novitates 3188: 1-39. Carpenter, J. M. 1996. Generic classification of the Australian pollen wasps (Hymenoptera: Vespidae; Masarinae). Journal of the Kansas Entomological Society 69 (4), supplement: 384-400. Carpenter, J.M. 2001. Checklist of species of the subfamily Masarinae (Hymenoptera, Vespidae). American Museum Novitates 3325: 1-37. Carpenter, J. M. 2003. On “Molecular Phylogeny of Vespidae (Hymenoptera) and the Evolution of Sociality in Wasps.” American Museum Novitates 3389: 1-20. Carpenter, J. M. & J. Kojima. 1997. Checklist of the species in the subfamily Vespinae (Insecta: Hymenoptera: Vespidae). Natural History Bulletin of Ibaraki University 1: 51-92. Carpenter, J. M. & M. C. Day. 1988. Nomenclatural notes on Polistinae (Hymenoptera: Vespidae). Proceedings of the Washington Entomological Society 90: 323-328. Carpenter, J. M. & M. Madl. 2009. A catalogue of the Vespidae of the Malagasy Subregion (Insecta, Hymenoptera). Linzer Biologische Beiträge 41 (2): 1871-1935. Carpenter, J. M., J. Gusenleitner and M. Madl. 2009. A catalogue of the Eumeninae (Hymenoptera: Vespidae) of the Ethiopian Region excluding Malagasy Subregion. Part I: Introduction, Key to Genera, Genera Aethiopicodynerus GUSENLEITNER 1997 to Cyrtolabulus van der VECHT 1969. Linzer Biologische Beiträge 41 (1): 513-638. Carpenter, J. M., J. Gusenleitner and M. Madl. 2010. A catalogue of the Eumeninae (Hymenoptera: Vespidae) of the Ethiopian Region excluding Malagasy Subregion. Part II: Genera Delta de SAUSSURE 1885 to Zethus FABRICIUS 1804 and species incertae sedis. Linzer Biologische Beiträge 42 (1): 95-315. Carpenter, J.M., J. Gusenleitner & M. Madl. 2010. A Catalogue of the Eumeninae (Hymenoptera: Vespidae) of the Ethiopian Region excluding Malagasy Subregion. Part III: Classification, Additions, Corrections and Index. Linzer Biologische Beiträge 42 (1): 919-1004. Carpenter, J. M., J. E. Strassmann, S. Turillazzi, C. R. Hughes, C. R. Solís and R. Cervo. 1993. Phylogenetic relationships among paper wasp social parasites and their hosts (Hymenoptera: Vespidae; Polistinae). Cladistics 9: 129-146. Gess, F.W. 2004. 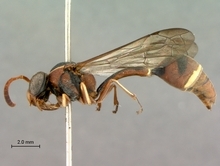 A revision of the Afrotropical species of the wasp genus Jugurtia de Saussure, 1854 (Hymenoptera: Vespidae, Masarinae). Howard Evans Memorial Volume. Journal of the Kansas Entomological Society 77: 669-720. Gess, F.W. 2005. Three new species of Masarina Richards, 1962 from southern Africa with a key to all species of the genus (Hymenoptera: Vespidae, Masarinae). Journal of Hymenoptera Research 14(1): 7-14. Gess, F.W. 2007. Four new species of the wasp genus Celonites Latreille, 1802 (Hymenoptera: Vespidae: Masarinae) from south-western Africa, designation of neotype for C. michaelseni von Schulthess, 1923, species representation in Namibia, and a key to species occurring in Namibia. Journal of Hymenoptera Research 16(1): 11 – 29. Gess, F.W. 2007. The genus Quartinia Ed. André, 1884 (Hymenoptera: Vespidae: Masarinae) in southern Africa. Part I. Descriptions of new species with complete venation. Journal of Hymenoptera Research 16(2): 211 – 233. Gess, F.W. 2008. The genus Quartinia Ed. André, 1884 (Hymenoptera: Vespidae: Masarinae) in southern Africa. Part II. A new species with complete venation and with deeply excised antennal club in the male.Journal of Hymenoptera Research 17(1): 83 – 85. Gess, S.K. 1996. The Pollen Wasps: ecology and natural history of the Masarinae. Cambridge, Mass. : Harvard University Press. 340 pp. Gess, S.K. & Gess, F.W. 2010. Pollen wasps and flowers in southern Africa. SANBI Biodiversity Series 18. South African National Biodiversity Institute, Pretoria, 147 pp. Guilherme J.L. & Wit, P. 2015. First records for Guinea-Bissau of Vitelline Masked Weaver and its nesting association with a paper wasp. ABC Bulletin 22: 200 - 203. Kojima, J. & J. M. Carpenter 1997. Catalog of species in the polistine tribe Ropalidiini (Hymenoptera: Vespidae). American Museum Novitates 3199: 1-96. Pickett, K. M. and J. M. Carpenter. 2010. Simultaneous analysis and the origin of eusociality in the Vespidae (Insecta: Hymenoptera). Arthropod Systematics and Phylogeny 68 (1): 3-33. Richards, O. W., 1962. A revisional study of the masarid wasps (Hymenoptera, Vespoidea): vii, 1- 294. Brit. Mus. (Nat. Hist. ), London. van der Vecht J. & Carpenter, J.M. 1990. A catalogue of the genera of the Vespidae (Hymenoptera). Zool. Verh. Leiden 260: 1-62. Photographs © Simon van Noort or Hamish Robertson (Iziko Museums) or Vida van der Walt (Pretoria).